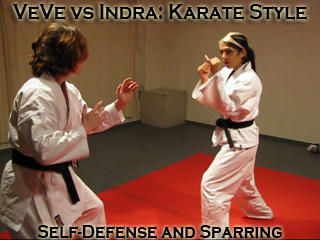 VeVe and Indra take on the roles of Karate masters who meet up in a secret facility for a practice session to keep their skills sharp. 1. Self Defense Session: The women trade combinations, reacting with karate techniques against incoming punch and kick attacks. Clean, distinct movements involving kicks, punches, elbows, knees, and throws. 2. Sparring Session: The women practice aggressive, combattive karate attacks and counter-attacks, working techniques at a faster pace, until one is takendown or overwhelmed. Both sessions maintain a very formal and traditional karate tone, with each combination or exchange starting and ending with a mutual standing bow. Although they meet for civilized training, even in training, only one can prevail; each session ends with a dramatic choke finish and bow from the winner.